Sixteen year old Rhea Shah never thought that she would find herself falling for her brother’s best friend, Joy Fernandez, when they come home from college. Because she never thought that the dork who used to go to school with them would suddenly reinvent himself in college.The only people she’s able to talk to about her absurd crush, are her best friends, Sophie and Arjav. Both of whom at first encourage, and then almost blackmail, Rhea to confess her feelings, which leaves the poor girl more muddled than ever! Meet Rhea Shah, a 16-year-old, who develops a crush on her brother, Robbie's, best friend, Joy Fernandez. Not knowing how to get a hold on her feelings, she adopts the alias The Guitar Girl in a misguided way. Rhea cares about her two best friends, Sophie and Arjav, although the latter knows how to push her buttons. She is pretty awful at hiding her feelings. Meet Joy Fernandez, who is 18-year-old and is Rhea's brother's best friend, as well as Arjav's cousin. 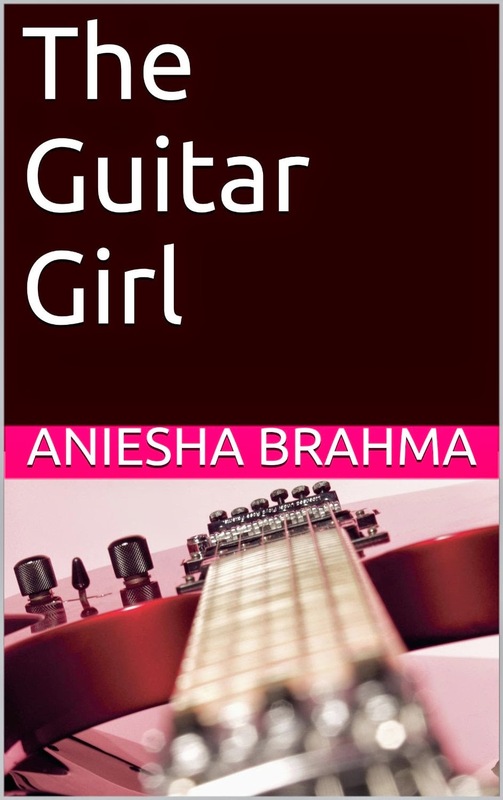 He takes on Rhea as his student, teaching her how to play the guitar, unaware that she harbours feelings for him. He can be pretty dense at times - refusing to see what is really happening right in front of his eyes. He dates a rather crazy girl in college, Rosetta, who later becomes Robbie's girlfriend. Meet Sophie Ghosh, Rhea's best friend in school, who discovers her secret at the beginning of the novel and keeps encouraging her to confess to Joy about it. Initially united with Rhea on the front by finding Arjav, she begins liking him more than a friend. Both she and Arjav believe in meddling with 'destiny'. Meet Arjav, Rhea's oldest friend, who knows her secret and wants her to tell Joy as well. He and Sophie like each other and likes to meddle with 'Fate'. And at last, meet Robbie Shah, Rhea's elder brother brother who has no idea that his sister has fallen for his friend. He is too preoccupied with his band and his girlfriend, Rosetta, who Joy had dated before him. The story is about a school girl who falls in love with her elder brother's best friend. Joy who was a dork in school, suddenly changes in to a super hot guy when he goes to college and Rhea has a difficult time controlling her feelings. And so it is for Joy because it is an unwritten rule that one doesn't hit on their best friend's sister. Both try to hide their feelings in a way best known to them - Rhea by writing a blog under the name 'Guitar Girl' and Joy by dating Rosetta, hoping it will take his mind of Rhea. But try as they may, destiny has different plans and Rhea and Joy keep coming together in some way or other. The story is about dreams, crushes, love, insecurities, friendship and college life. Will Rhea and Joy give up trying to hide their feelings for each other? Will Robbie accept their love? What happens when Joy finds out that Rhea is the Guitar Girl, whom he had considered as his confidante? Read the novel to find out more. The entire story was told through emails, chats and diary entries, which was a different approach and I liked it to some extent. The story line is interesting and keeps the reader engrossed. I was curious as to how the story will progress and couldn't stop reading till I finished the whole book. The story was different and made an interesting read. The characters were built in such a way that you could relate to them. I especially liked Rhea's journal entries. There were many typos, which sometimes spoiled the fun of reading. Also, few things appeared cliched like Rhea opens a blog and Joy will be the first one to comment on it! Too much coincidence? Or when they enter the Talent Hunt, Rhea knew about the death clause; she had mentioned it in a mail to Sophie but at a later point, she freaks out when she finds out about it! I mean she already knew about it, right? There were some areas like this, where some more effort was needed. All in all, this book was an OK read for me. This book is a quick read which will take you back to your college life. There were some doses of humor, which will keep the readers entertained. I will recommend this to teenagers especially and also to those who like to read about teen love.